Have you been to this event? Let other tangueros know what you think by rating it! Just click on the percentage bars. And, if you feel like providing further details, feel free to drop a few lines at the comments section. ... in other words, a 20-hour immersion seminar focused exclusively on foundations, stripping your dance to its essential components and rebuilding it from the bottom up and from the inside out! - milonga lisa vs. milonga traspie. As always, we will *not* cover fancy steps and sequences in this seminar, but rather focus on building and refining your movement. Our goal is not to add figures but to add comfort, quality and expression, and to unify the knowledge you have accumulated over the years. Sign up also for "The Walk, Pivots and Turns" on February 5-9 (https://www.facebook.com/events/437807309928176/) and save! US$600/person for both seminars! Option to hire an advanced dancer from Buenos Aires to assist you in class! Please check http://www.danielayluis.com/immersion-seminar- for more details and email us or send a Facebook message for registration! Is registration required prior to the event? 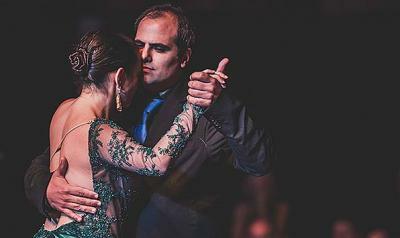 Argentine tango dancers based in Buenos Aires, touring yearly in North America and Europe.